If you don’t consider your real estate agent biography to be a fundamental tool in reaching potential clients, the time to change is now! A strong bio can attract new clients, lay the groundwork to build interpersonal relationships, and offer potential clients a reason to trust you. By seeing you’re a real person, they’ll see you as more than just a real estate agent – you’ll transcend to the status of real person with family and hobbies all your own. You’re the expert when it comes to real estate, don’t hide this quality. A well-rounded biography should include your skills, expertise, education, experience, and awards. Generate a list of facts you want to include, but don’t go overboard. If you find yourself with a long list of facts, narrow it down to only the best achievements and include those in your biography. Then, if you want to take it further, provide a link or a complete list of credentials at the bottom of the page. By adding some insight into your personal life outside of work can be a great tool for connecting with potential clients. Including information about your family, pets, hobbies, and extracurricular activities, your clients will see you as a real person rather than just a Realtor. And, who knows when someone might contact you simply because you have something in common with them. Don’t bog your biography down with too many fun facts though, keep things light and to the point, and avoid getting too intimate with your personal details. You know the area better than anyone else, so be sure to include information about where you’ve lived and how long you’ve been an agent there. Demonstrate your knowledge of the area. On the other hand, if you’re new to the region, mention why you moved there and everything you love about it. This is a great way to build trust with your clients as they’ll need your guidance in finding the right home. Two to three paragraphs, or about 250 to 500 words, is the optimal length to shoot for. Any longer and your readers could lose interest. You want to connect with your readers, not scare them away with a wall of text, or an equally frightening two sentence bio. Give them an idea of who you are what you’ve done, and avoid sharing your life story. Your bio is the perfect opportunity to demonstrate just how professional you are, so make sure your writing is 100% error-free. Correct spelling and grammar is an absolute must and a single error has the potential of turning a client away forever. Ultimately your bio is one way of helping your client’s get to know you so they’ll want partake in your services – so be sure to include your contact information at the end of your biography. This will give your potential clients an immediate and easy way to contact you and access all you have to offer. 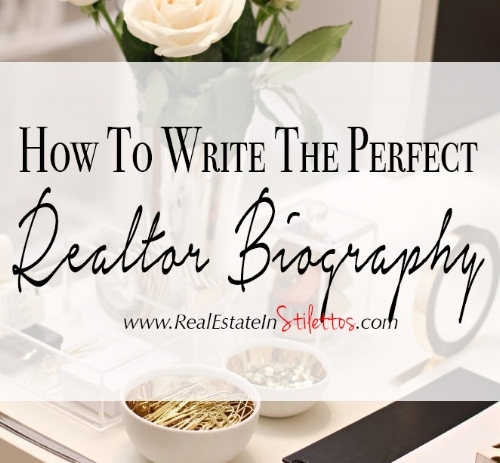 Writing or refining your real estate agent biography should be at the top of your to-do list. It’s inexpensive and effective, and the best part is you can use it over and over again! Include it on your website, blog, in your listing presentation, brochures, social media pages such Facebook and LinkedIn, and every other place you’ve made your online presence known. Just make sure to keep it updated by reviewing it every six months or so. Once you’ve created a bio, you’ll have a great tool to help you bond with potential clients before you even meet them, making you another step ahead of your competitors.